Stunningly beautiful shrub that lives up to its name! 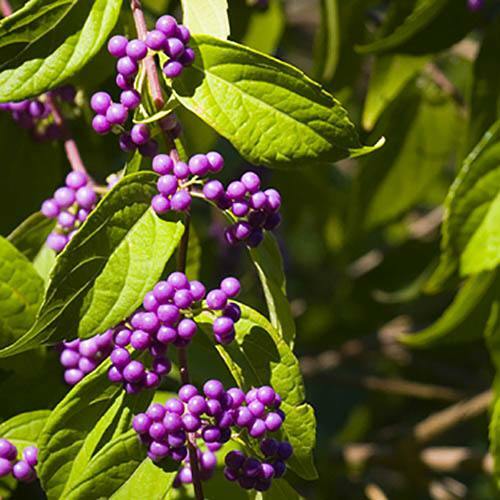 Metallic purple-pink berries in dense clusters in autumn and winter. Perfect for flower arranging! Foliage changes colour throughout the year. Bronze to dark green to golden purple! Sometimes its hard for a plant to live up to its name, but Beauty Berry doesnt fail. This desirable shrub is grown for its long-lasting display of metallic pink berries that cling in dense clusters to bare branches between autumn and late winter. Excellent grown alongside other shrubs in a sunny or slightly shaded position, this bushy deciduous plant grows to around 3m, but can be kept more compact by pruning. In spring its young foliage is tinged a lovely shade of bronze before turning dark green, while summer interest is provided by a mass of pink flowers. A must have! Supplied as a set of 3 Beauty Berry plants in 9cm pots.